The DEWALT DC385B 18-Volt Cordless Reciprocating Saw is the reciprocating saw you should use if you want a mobile yet powerful tool for your simple, intermediate, or advanced sawing jobs. The unit mainly offers versatility. It allows you to flush cut parts of your work piece while providing you good control and grip when sawing. You can achieve a professional cutting job thanks to this Dewalt equipment. The equipment also provides a safe sawing experience with its anti-slip grip that improves your control on quick cuts without compromising your comfort. The unit is a proportionate and well-built cordless saw but is also lightweight and durable. 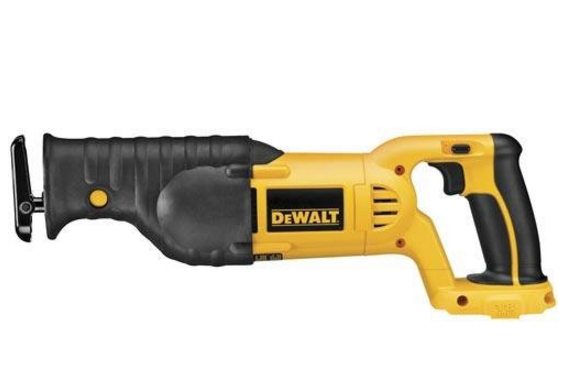 The DEWALT DC385B is cordless, which means that it is battery powered. It is very light so it allows users easy and comfortable use of this tool. Even though this tool does not get its power from a steady source of energy such as electricity, it is still able to deliver powerful cutting functions on a variety of materials. With a stroke length of 1⅛-inch and RPM rate of 0- 3000, this cordless bare-tool allows for fast and flush cutting while securing that your hands and body are safe from injuries with its anti-slip grip and blade clamp. Unlike other power saws incapable of flush cutting, this unit enables users to perform advanced woodworking projects involving the cutting of protruding and exposed work pieces. Flush Cutting – A 4-position blade clamp allows for flush cutting and improves the versatility of the equipment. This DEWALT Bare-Tool DC385B Reciprocating Saw has gotten 525 Amazon reviews at the time of writing; garnering an average of 4.5 stars. 71% of the customer reviews gave a 5-star rating for the equipment. The top customer rating gave 4 stars for the unit with the buyer stating that the unit was well-engineered. He stated the features that he likes about the unit such as being well-balanced, rugged, light, excellent collet boot, and good quality power. He added that he wished for some improvements with the battery. Overall, he expressed that this equipment is his favorite out of all the versions of this saw he has used. But just like any other tool, some people have found disappointing features on this unit. One customer wrote a review saying there is a single evident design flaw on this equipment, which is why he only gave it a 2-star rating. He stated that the saw does not have an extra piece that will protect the battery. His battery contact became bent after a few instances of partially dropping the saw on the ground due to the nature of his work. It seems that the customer may have skipped some proper caring practices for his cordless saw or he may have needed a heavier-duty tool due to the nature of his work. He did, however, expressed that in terms of power, the DEWALT tool was able to deliver. In general, the unit received positive reviews including “great value”, “more useful than expected”, “perfect addition to tool bag”, “does the job with no hassle at all”, and many others. It appears that many customers have had a pleasant experience using the unit as I did. People have used this reciprocating saw for their home and shop woodworking projects with the level of versatility it possesses. It is a tool that can be used by anyone because of being lightweight and safe grip. As for beginners, using this tool is a matter of familiarizing themselves with the weight and the movement of the saw. When a user is able to master the grip and control of this tool, he will be able to perform a wide variety of cutting jobs. With all of these benefits said, you can expect great things and great results from the DEWALT DC385B Cordless Reciprocating Saw. It is a guaranteed tool that gets the job done for simple and advanced woodworking cuts with its powerful action and fast cutting speed. You can prevent injuries with this unit through its pivotal adjustable shoe that provides good visibility and its anti-slip grip features. It is deserving to be deemed as the best cordless reciprocating saw. Read more about other best reciprocating saw here.